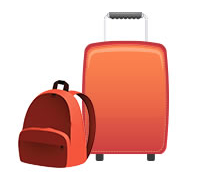 My Baggage is the best way to transport your excess baggage within the UK. We offer a fast, reliable and stress-free service – all for a price you can afford. We’ll transport your extra baggage from your home, straight to where it needs to go. We offer a convenient door-to-door baggage collection and delivery service to all addresses in the UK. We have super fast delivery times of 1-2 days or even next day with our Express service, so you don’t have to be without your belongings for long. Whatever your reason may be for needing to transport your excess baggage, at My Baggage we understand that it can be quite an effort. If you’re travelling by car, packing it in could be difficult and it may put a hefty strain on your fuel costs. If you’re travelling by plane, you can expect quite an expense, if you’re needing to pay for an extra bag on your flight. Even if you’re travelling by bus or train, it’s near impossible to carry a bunch of heavy bags with you – it’s the last thing you want! My Baggage takes all of this weight off your shoulders – literally. We’ll take care of your excess baggage, so it’s one less thing for you to have to worry about as you travel or relocate. We can understand that handing your personal belongings over to a luggage shipping company might be a daunting thought – but thankfully, we’re the experts at shipping baggage. We help tens of thousands of people ship their belongings across the UK and beyond. For that extra peace of mind, we provide full online tracking as well as SMS and email notifications to keep you updated at all times. We even have a dedicated customer service team ready to answer any queries you might have via phone, live chat and email. When sending excess baggage, saving money is a top priority, that’s why we offer great low rates on all deliveries thoughout the UK. You can send a box or suitcase weighing up to 30kg for as little as £16.99 within the UK. And once you have booked and paid for your shipment, there are no extra hidden charges. My Baggage offers a great Price Match service! So if you happen to find a better quote elsewhere, we will do our very best to beat it.